This top floor, corner Condominium in the beautifully maintained Kona Reef Condominiums awaits you! •	Relax on the private lanai and watch the wave, the surfers, the dolphins, the sunsets …. and BREATHE in that fresh ocean air! •	You can relax by the pool, in shade or sun, or sit on the grass (or on the comfy chaise lounge chairs) at the edge of the ocean. •	Use the immaculately cleaned barbecues (4) to grill up fresh fish or steaks and watch the sunset - ahhhhhhh! •	There is a public sandy beach bordering the Kona Reef to the south. We enjoy going into the ocean from this beach -- easier access for snorkeling than directly out front of the condo. •	The relaxing stroll along the waterfront into the quaint town of Kailua is wonderful - from early morning (there are a couple of great coffee shops that open early, allowing you to sit outside and watch the waves splash on shore) until late at night. No need to hassle with driving - the shops and restaurants, spas and even a luau - are all within easy walking distance from our condominium. •	You can keep busy from morn 'til midnight, exploring the Kona Coast - hiking, biking, birding, fishing, snorkeling, scuba diving, exploring remote beaches, the volcano, green and black sand beaches – or just sit and enjoy RELAXING! •	Come! Stay awhile - Relax, renew your energy and soak up the beauty of creation all around! 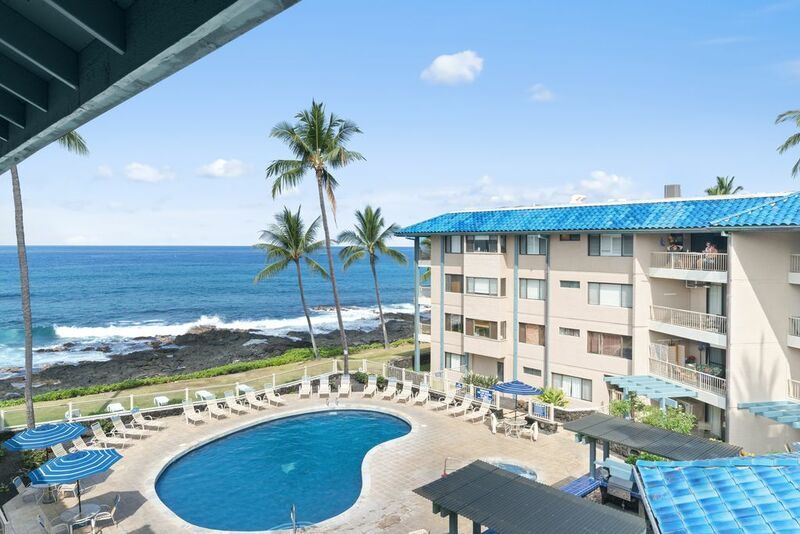 Note: We own another condo here at the Kona Reef -- check out our other listing (vrbo # 27574). We are OWNERS ... not property managers so we invite you to enjoy our Kona Home! Cancellations made within 30 days of reservation are non-refundable unless unit is rented to another guest. There are no refunds for arriving late, early departure or ‘no shows’. We advise guests to purchase Trip interruption / Cancellation Insurance if you think it wise. We thrive on the beauty of the water and waves. It is incredibly relaxing and refreshing. We thoroughly enjoy the proximity to Kailua --we can walk everywhere we need to get to ... and we love it! Newly renovated; walk-in shower stall; outside windows (above shower area) for great fresh air ventilation. Room air conditioner in the living room --(set on a timer). The ocean breezes, windows and ceiling fans mean we rarely have to have the air conditioner on! In the bedroom, there are windows on two walls and a ceiling fan directly over the bed. Full-sized dryer in our condo for your private use. We have password protected wireless access for our guests. No Smoking in condo or on lanai please. We have pool area towels, sand chairs & mats for your use. The condo is outfitted with everything to make you feel right at home! We have a nice lanai patio set so you can sit for hours watching the waves if you so desire. There is refreshing access to side windows in each and every room of the condo - even on the lanai! The Hawaiian breezes are soothing - allowing freedom from the air conditioner's blast (if you so desire we DO have air conditioning as well). And we have a new King-sized bed for great slumber! Sightseeing (including an active volcano! ), & Birding - and RELAXING with loved-ones!